Pulaski County USA Tourism Bureau & Visitors Center will be closed Monday, December 25th and Tuesday December 26th. We will resume normal office operations Wednesday, December 27th. Visit us anytime, online at http://www.PulaskiCountyUSA.com. Merry Christmas & Happy Holidays! What: A downtown holiday light experience. Friday & Saturday night also include Village Market. When: 6:00 until 9:00 p.m.
What: Old Bethlehem comes to life with over 100 different characters and animals during this live nativity. When: 5:00 until 9:00 p.m. 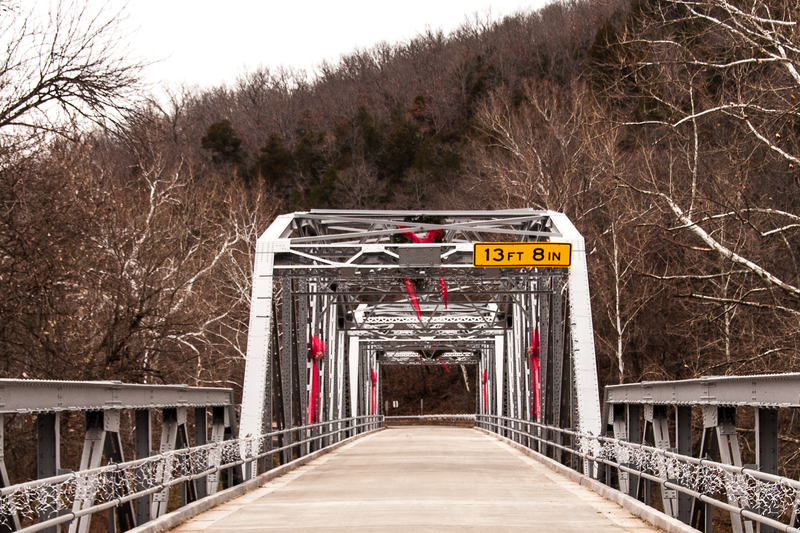 The recent closing of the Hazelgreen Bridge on Route 66 in Laclede County, between Waynesville and Lebanon has brought massive amounts of attention from across the globe to the historic river crossings of the Mother Road. 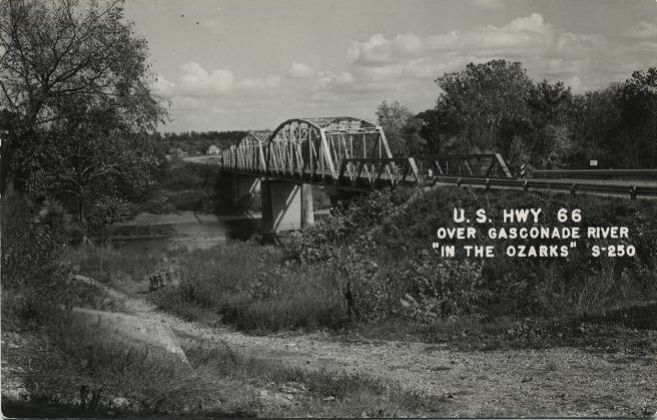 This vintage postcard of Hazelgreen Bridge on Route 66 between Waynesville and Lebanon, MO is undated. Image courtesy of 66postcards.com. The Hazelgreen Ridge on Route 66 over the Gasconade River was closed to traffic indefinitely December 18, 2014. A rally, organized by Route 66 enthusiast “Roamin” Rich Dinkela was held at the bridge December 23, 2014. Those in attendance asked for MODOT to seek out ways to rehabilitate and repair the bridge. Photo courtesy of Pics By Jax. 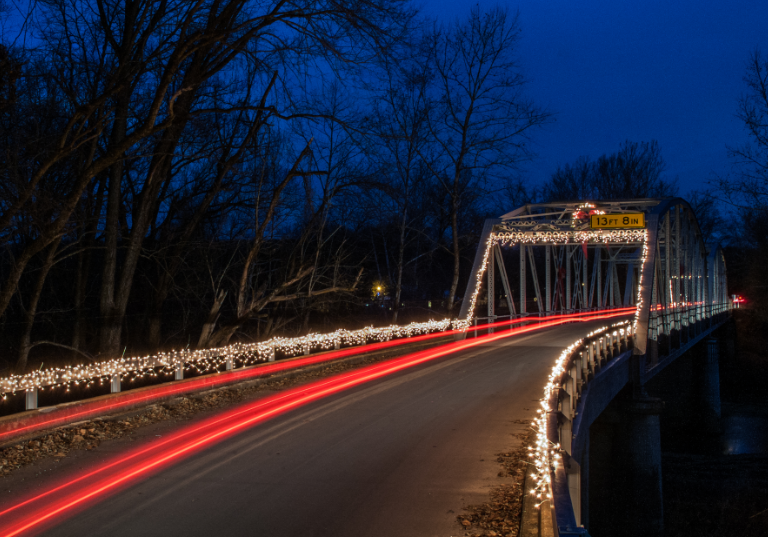 Pulaski County is a not-so-hidden gem on the crown of Route 66 bridges. 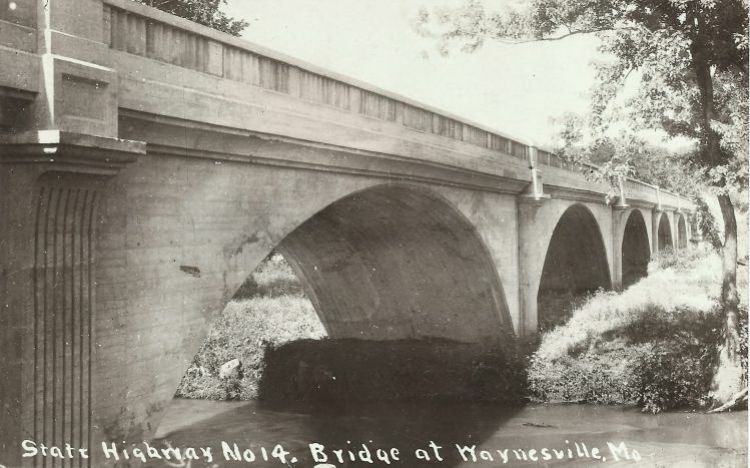 Three bridges are distinct ties to the promise and heyday of Route 66- the 1923 Devils Elbow Bridge (which pre-dates Route 66), the 1942 Devils Elbow Arch Bridge, and the 1923 Roubidoux Bridge (also pre-dating Route 66) in Waynesville. Vintage postcard of the Devils Elbow Bridge over the Big Piney River on Route 66 between Rolla and Waynesville. Image courtesy of 66postcards.com. 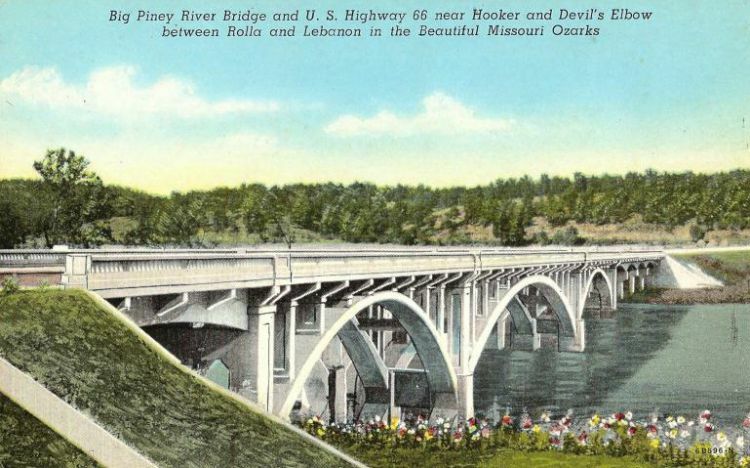 Vintage postcard of the Devils Elbow Concrete Arch Bridge over the Big Piney River on Route 66 between Rolla and Waynesville. Image courtesy of 66postcards.com. 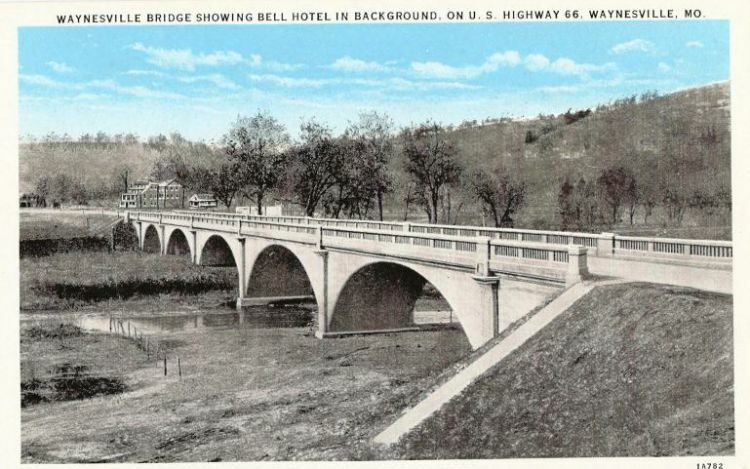 Vintage postcard of the 1923 Roubidoux Bridge on Route 66 in Waynesville, MO. Image courtesy of 66postcards.com. The fate of the 1923 Devils Elbow Bridge was questioned for years. This crossing is unique in the fact that it was bypassed by a new bridge on a later alignment of Route 66 in 1942. Missouri Department of Transportation relinquished control of the bridge to Pulaski County. Drawing mainly local traffic and Route 66 enthusiasts the bridge continued to deteriorate until a solid plan to rehabilitate the bridge was finalized. The 1923 Devils Elbow bridge closed to all traffic October 2013 and re-opened May 2014. Today, the bridge is like new- strong, sturdy, and safe and ready to carry travelers from around the globe across the river. The refurbished bridge has reenergized the village of Devils Elbow. 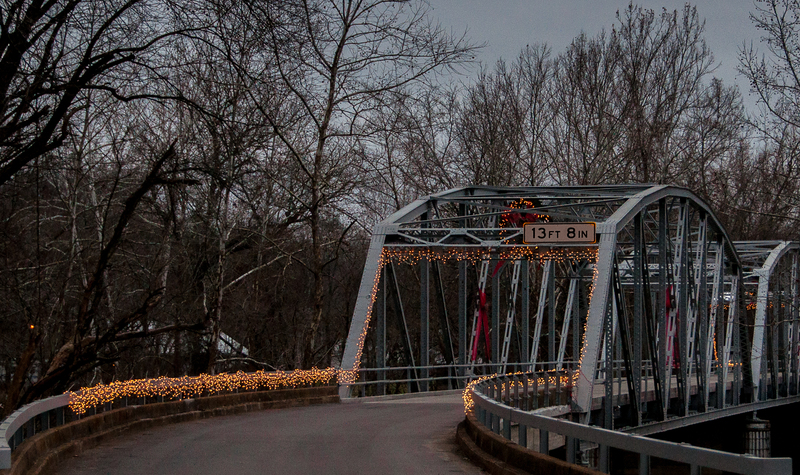 Residents of Devils Elbow have decorated the recently rehabilitated Devils Elbow Bridge for the holidays. Photo by Pics By Jax. The 1942 Devils Elbow Arch Bridge, was designed by the Missouri State Highway Commission. Composed of three open spandrel arches and five arched girder approach spans, it was constructed by Maxwell Construction Company. Maxwell Construction Company constructed almost a dozen, if not more, bridges in Kansas, Arkansas, and Missouri between 1912 and 1942. They were also the company that constructed the Pikes Peak through truss bridge between Waynesville and Crocker on Highway 17 in 1932. Pikes Peak Bridge was demolished October, 2009. After completing the 1942 Devils Elbow Arch Bridge the company was paid $47,707.00. Federal financial sources played an important role in the construction of this bridge- money was made available through the Strategic Highway Fund and the Emergency Relief Fund, both byproducts of World War II. The open spandrel design was used frequently by the Missouri State Highway Department between 1920 and the early 1940’s. According to HAER Inventory- Missouri Historic Bridge Inventory, regarding the open spandrel bridges this bridge has “one of the longest spans of those identified by the statewide bridge inventory.” The report also states that that due to the late construction date that the bridge has “no noteworthy technological significance”. 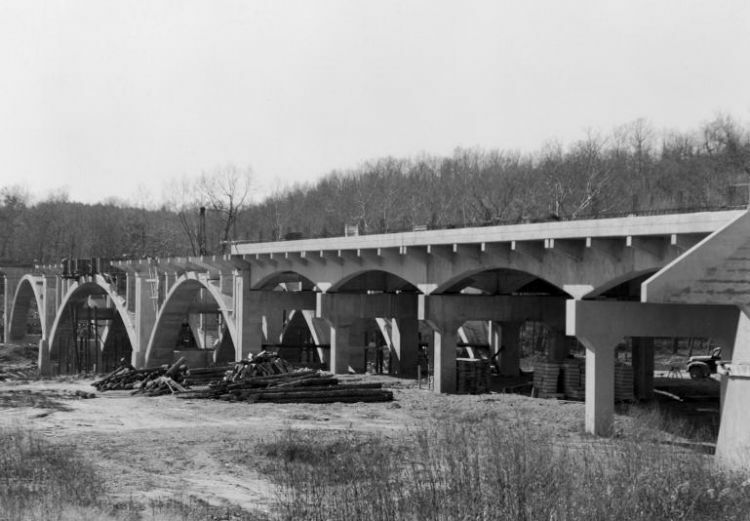 However, in a National Register of Historic Places Multiple Property Documentation Form prepared by Ruth Keenoy and Terri Foley they state that “concrete open spandrel arch bridges signify one of the great engineering accomplishments of early twentieth century bridge construction” and further states that “the Big Piney River Bridge is an excellent example”. The 1942 Devils Elbow Arch Bridge is unchanged from its original construction. A rare image of the 1942 Devils Elbow Arch Bridge during construction. 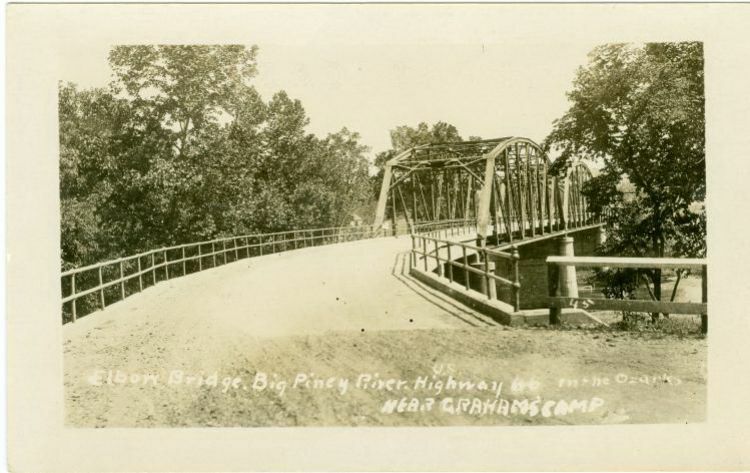 MODOT photo. 1942 Devils Elbow Arch Bridge over the Big Piney River on the 4 lane alignment of Route 66 between Rolla and Lebanon as seen in 2014. Photo by David Harbaugh. The 1923 Roubidoux Bridge was also designed by the Missouri State Highway Commission in 1922 to carry traffic across the Roubidoux on Missouri State Highway 14. Missouri Highway 14 was later designated as Highway 66. Builder Koss Construction Company of Des Moines, Iowa was paid $44,035.00 for their work after completion. Koss Construction Company constructed almost a dozen, if not more, bridges in Missouri, Iowa, Alabama, Minnesota, and Michigan. 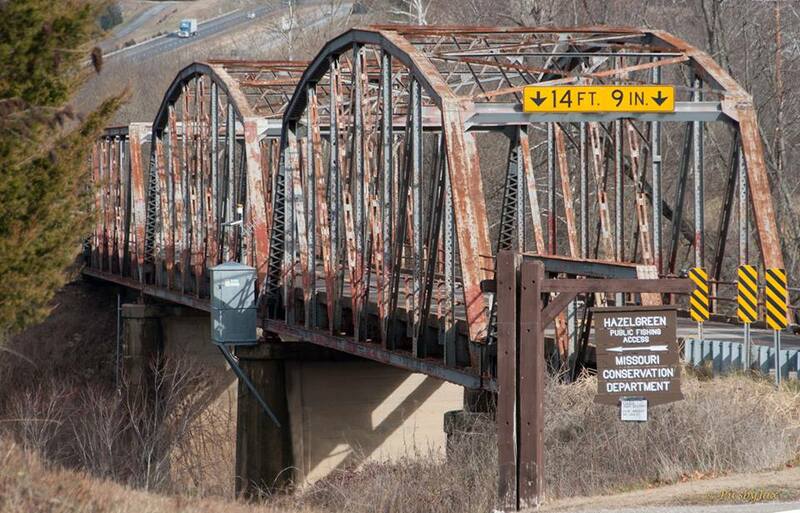 At least two of their bridges, Galena Y Bridge in Stone County, Missouri and Mendota Bridge over the Minnesota River in Dakota County, Minnesota have been added to the National Register of Historic Places. This bridge is a closed, or filled concrete spandrel bridge, a variation of the concrete bridge design that was often used by Missouri State Highway Department in the 1920’s, 1930’s, and 1940’s. This bridge, along with the Meramec River Bridge in Crawford County were the only two remaining examples of this bridge type in a five span formation when the Historic American Engineering Record completed its Missouri Historic Bridge Inventory. The Meramec River Bridge on Highway 19 was lost in 2000. The 1923 Roubidoux Bridge was widened in 1939 when the bridge was 16 years old and has had no further alterations in the following 75 years. Vintage postcard of Roubidoux Bridge in Waynesville on Missouri State Highway 14, later Route 66. Image courtesy of Steve Rider and 66postcards.com. Roubidoux Bridge on Route 66 in Waynesville as seen in 2014. Photo by Pics By Jax. 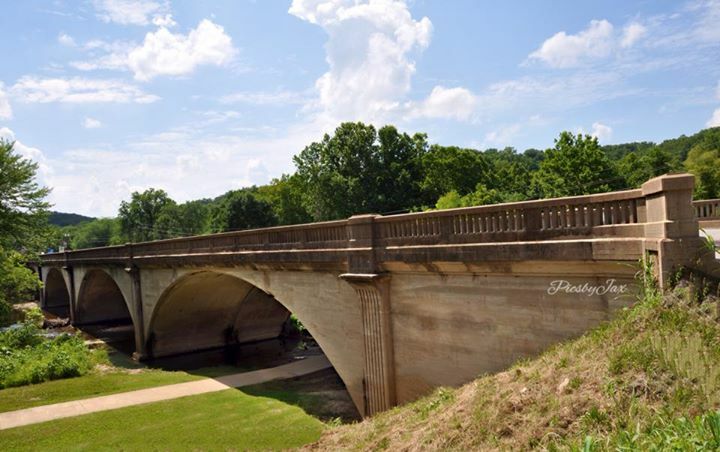 The historic bridges on Route 66 in Pulaski County are more than just bridges. These bridges are links, connecting Chicago to Los Angeles and also connecting travelers from around the world to tangible Americana in the largest open air-museum in the United States. *Thank You to Jim Ross, author of “Route 66 Crossings: Historic Bridges of the Mother Road”; Terry Primas of the Old Stagecoach Stop, and http://www.bridgehunter.com for their contributions to this article. The Devils Elbow Bridge was dedicated July 4, 1924 and is considered by many to be a Route 66 icon. 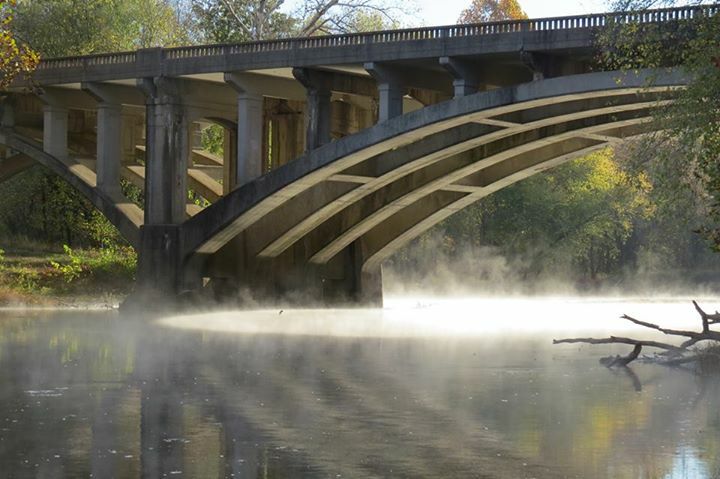 The bridge has allowed safe passage across the Big Piney River during its 90+ years of service. The bridge recently had a second life breathed into it when it went under a massive rehabilitation project overseen by Great River Engineering. Today, the bridge is like new- strong, sturdy, and safe and ready to carry travelers from around the globe across the river. The citizens have celebrated the revitalization of their beloved bridge in a new way this year- a first in the bridge’s history. 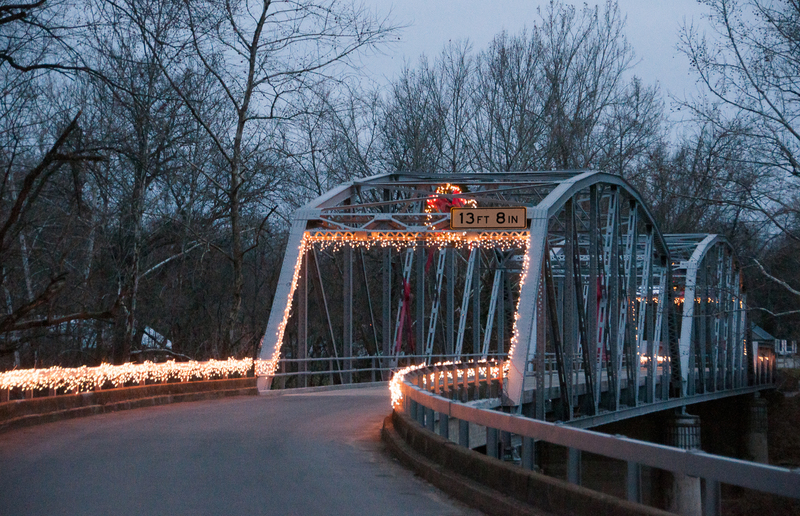 The bridge has been decorated with Christmas lights and it is fabulous! This is sure to become a tradition in the ‘Bow and we hope that visiting the bridge during the holidays becomes a tradition for you and your family also. Devils Elbow has always been a very special place on the Mother Road- the lights make it magical. Devils Elbow Bridge, December 2014. Photo by Pics By Jax.